This is a semi-automatic trading robot. Buttons are used to open/close positions. 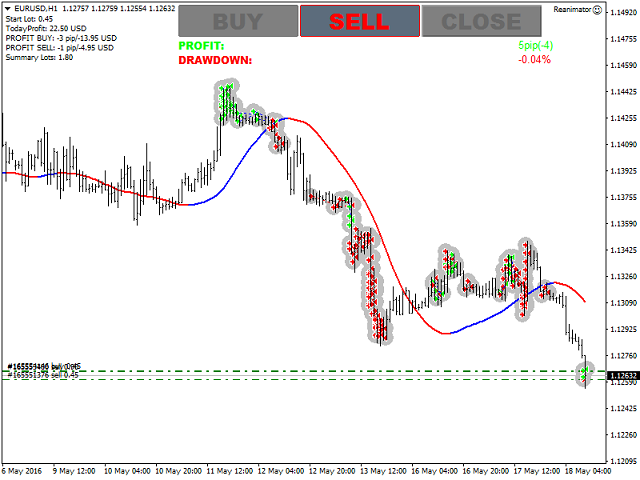 Further position tracking is performed automatically by virtual profit level. Loss-making positions are averaged by increased/decreased lots. The buttons do not work in the strategy tester meaning that you can check the EA only on demo and real accounts. Special settings OPEN_BUY and OPEN_SELL can be used to test the EA in the strategy tester. Добавлено две линии, перемещая которые можно ограничить торговлю советника. Если цена подымается выше линии покупок, то торговля в сторону покупок прекращается.